It was past 1:00 a.m. and I was sitting up late in bed, reading what I am sure was the latest ground-breaking historical Christian fiction book on the market, when I heard Baby Betsie crying. My gracious husband – who, unlike me, does NOT sleep like a giant, inanimate boulder from the Rocky Mountains – usually handles the middle-of-the-night stuff, and so I was happy to hop up and handle this situation for him while he slept. I ran up the stairs and tiptoed through our large, dark nursery, and, arriving at Betsie’s crib, gave her her pacifier and was covering her back up when I heard a sound behind me. I blinked three more times. A robed figure, unaware that I was in the room, was rising from the twin bed by the window. 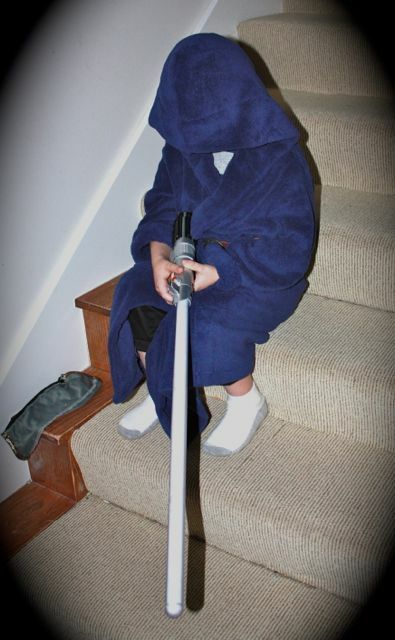 Standing up next to his bed, he pulled his hood up over his head, and bending down, quietly retrieved his lightsaber from the floor beside him. 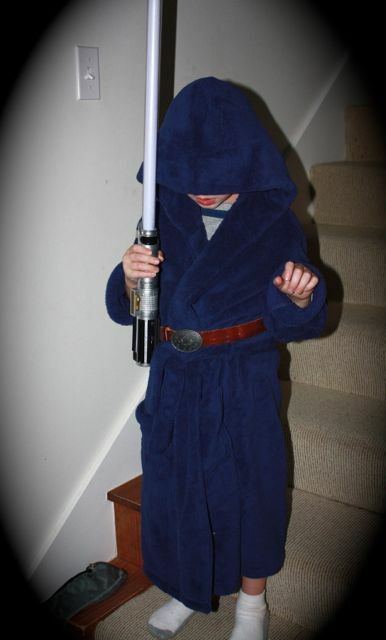 Standing back up, lightsaber held high, he shuffled noiselessly out of the room. And I, snapping out of my open-mouthed, fascinated gaze, took off like a flash of lightning, and, running past him, fled down the stairs and to the office to retrieve my camera. By the time I made it back to the stairs, he was sitting there near the bottom, apparently waiting for me. “Can I take your picture?” I whispered, in the dark. He nodded, keeping his head down. and shuffled into our bed, where we all spent the rest of the night snuggled close together, him, me, his Papa, and his lightsaber. 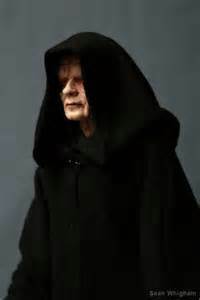 It was the first time I’ve ever slept with Emperor Palpatine…or anyone from Star Wars, for that matter. It wasn’t as creepy as I thought it would be.